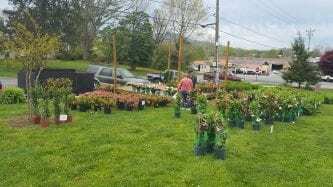 HIAWASSEE, Ga. – Hiawassee Town Square was the site of the annual “Plant Affair on the Square” Saturday, April 13. The heart of Hiawassee was filled with vibrant blooms and vendors, including booths to support Earth Day awareness. 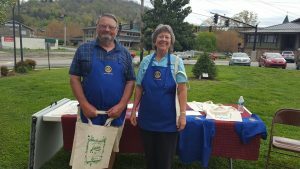 The Rotary Club of Lake Chatuge-Hiawassee offered complementary, reuseable totes to visitors, an act to encourge a reduction in plastic shopping bags that can be detremental to the environment. The Rotarians are connected to 1.2 million members worldwide, and the local chapter participates in a wide range of community service projects. 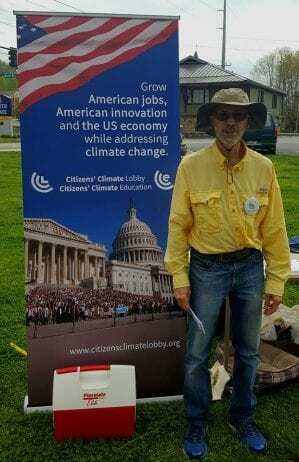 Vernon Dixon, a climate change activist, was on-hand to dispense information on the Citizens’ Climate Lobby. The mission of the lobbyists involves implementing a plan which will reduce national greenhouse emissions by 52 percent, add 2.8 million jobs to the economy, and improve overall air quality. The organization is working to impose a fee on fossil fuels at the mine, well, or port of entry source, distribute net revenues to US households to offset higher energy prices due to the fee, and encourge a border tariff adjustment to discourage businesses from relocating to areas where they can emit additional carbon dioxide. Citizens’ Climate Lobby is a nonpartisan, non-profit organization. Clean Sweep Week, which was extended to a two week period this year, begins April 15, and runs through April 27. Residents are encouraged to obtain specially-marked bags from the Towns County Courthouse, Hiawassee City Hall, Young Harris City Hall, or either county library branch to collect roadside debris. Gloves and safety vests are available to volunteers. Collected trash can be delivered to the Towns County Transfer Station at no charge. Cash awards will be extended to the individual, business, and organization which collects the greatest amounts. Clean Sweep will not be in effect on Good Friday or Passover, in observance of the holy days. HIAWASSEE, Ga. – Towns County Commissioner Cliff Bradshaw announced at his monthly meeting Feb. 19 that the county was awarded a grant in the amount of $160,727 to improve area roadways. “We learned of this last year and I couldn’t wait to announce it,” Bradshaw said. The commissioner read aloud a portion of a letter received from the Georgia Department of Transportation, informing that last year saw the first increase in roadway fatalities in a decade, with 45 percent of the fatalities occurring on county roads. State Senator John Wilkinson worked at securing the grant, Bradshaw said. The funds will be used to restripe county roadways, provide needed signage, and install speed bumps where necessary. Commissioner Bradshaw reported that Towns County is to receive three quotes from roofing companies to repair the flat-portion of the “old” recreation center roof due to continued leaking into the area where the Towns County Historical Society meets. The initial quote returned was $78,000, and Bradshaw said that he intends to comparison shop. 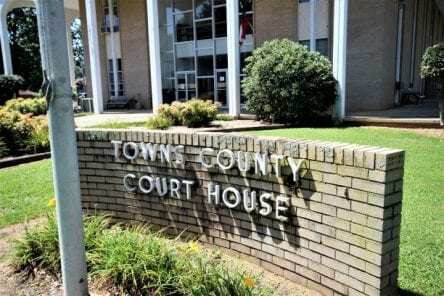 The commissioner announced that Towns County Recreation Center recently profited $2,300 from gate and concession sales, a result of the 12U basketball tournament. Commissioner Bradshaw will hold the next county meeting Tuesday, March 19 at 5:30 in the Towns County Courthouse. Meetings are open to the public. Questions and comments are accepted at each session. HIAWASSEE, Ga. – Liza Strub and her husband, Chuck Coxe, spoke to a full house of Mountain Movers and Shakers at Sundance Grill on Friday, Jan. 25, continuing to advocate for a litter-free county. 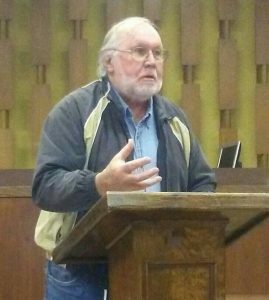 Strub, a Towns County resident who publicly jumped onboard the clean-up effort last summer, speaking out at a county meeting, is quickly proving grit and determination in advancing the cause. In past weeks, Strub has made several speaking appearances, including a presentation before the Towns County Civic Association, and a second visit to the county commission. Prior to Strub and Coxe’s introduction, Grace Howard of Hamilton Gardens provided the history of litter control endeavors in the area in which she has been an active, appreciated participant. It was noted during the meeting that the annual Clean Sweep Week event will be held for two consecutive weeks, rather than one, each spring. Strub informed that she will be working with students enrolled in the local C.H.A.M.P.S. program, encouraging investment in litter control from civic-minded youths, as well as motivating other area organizations through education. Set an example for children, family, friends, neighbors, visitors, and community. Secure your load and sweep out your truck bed. Use a litter bag and ashtray in your car and clean out your vehicle when you stop for gas. Keep gloves and bags in your car and pick up trash when you see it. When you take a walk and see trash, pick it up. Adopt a road, spot, or beach in your neighborhood. Just an hour a week of picking up trash sets an example. Before lighting up, identify where to dispose of cigarette butts when finished smoking. Spit containers for chew belong in the trash, not on the roadways. Make sure that trash cans have securely fastened lids or use bungee cords to hold them in place. Keep a litter bag in your boat and use it. Keep the appearance of your home or business clean and neat. Business owners should provide trash receptacles in convenient locations. 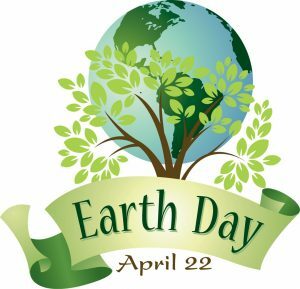 Get involved and volunteer in events such as Clean Sweep Week, Lake Chatuge Clean-up, Adopt-a-Road, or educational programs. Start a litter awareness program at your church, civic, or volunteer organization. 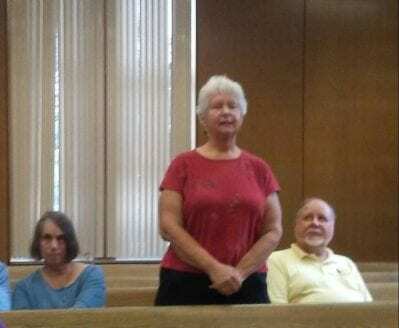 HIAWASSEE, Ga. – Liza Strub, a concerned citizen of Towns County, petitioned Commissioner Cliff Bradshaw to re-address the issue of roadway litter during last year’s July county meeting. 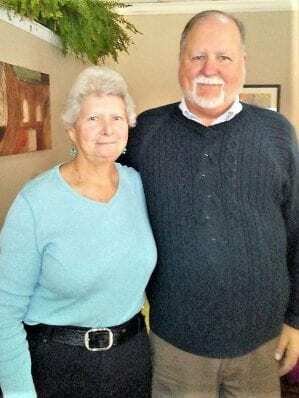 In the months that followed, Bradshaw met with Stroub on several occassions to form a heightened approach, with the commissioner following through by adding Strub to the Jan. 15, 2019 session agenda. 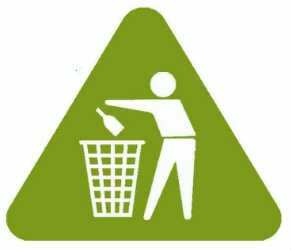 Clean Sweep Week, once an annual event, will become a twice-yearly initiative, with education focused on litter prevention, introduced to the public over a period of time. Strub explained that it often takes repeated attempts before messages sink in, and the course of action will include litter education through various sources such as print, social media, public service announcements, radio, in person, and what Strub deems most important, through positive example. During Tuesday’s public meeting, Commissioner Bradshaw affirmed that the “Secure Your Load” project enacted last October is proving to be effective. Following the distribution of information, the Towns County Transfer Station tallied 497 unsecured loads delivered in November of 2018. In December, the total decreased to 189. Thus far in January, 73 were listed as uncovered, suggesting an additional month of sharp decline in illicit transport. Hiawassee Mayor Liz Ordiales attended the county meeting, revealing that city employees are making a weekly effort to remove litter from area roads. Citizens in attendance expressed appreciation for the mayor’s approach in combating the problem. Strub plans to promote an Adopt-a-Spot program, working with a host of organizations including the civic association, area groups, and local schools to advance the goal of keeping the area litter-free. 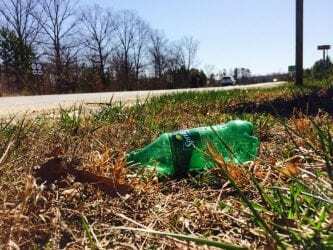 HIAWASSEE, Ga. – Towns County Commissioner Cliff Bradshaw, in cooperation with Towns County Conventions and Visitors Bureau Executive Secretary Jane Hedden, is asking for the public’s efforts in keeping the area pristine and litter-free. “Towns County is our home, and we should all do our part to keep it beautiful,” Commissioner Bradshaw urged. Towns County plans to distribute printed information on the incentive from key locations in the near future. Garbage transported in vehicles should be covered and secured to prevent contents from flowing onto roadways. Tips for securing loads involve covering the rubbish with sturdy plastic, canvas tarps or nets, held in place with rope, bungee cords or straps. Lighter weight items should be transported at the bottom of the load in order to prevent it from exiting the vehicle duting transit. Trash transported in truck beds is encouraged to be hauled inside of a five-gallon can. The county urges residents to sweep truck beds prior to leaving the transfer station. A broom will be provided. The requests are pursuant to Georgia State Laws OCGA 40-6-248 and 40-6-254, in addition to Towns County Ordinance Section 36-31. 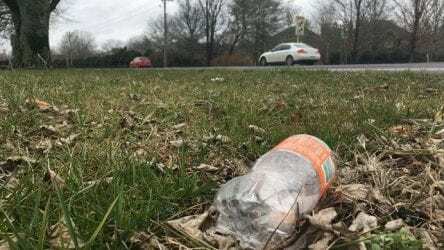 Although volunteer roadside and shoreline clean-up events are scheduled annually, the issue of litter is a year-round concern. On the first Saturday in November, the Hiwassee River Watershed Coalition is scheduled to host its 8th Annual Lake Chatuge Shoreline Cleanup, in conjunction with Georgia Rivers Alive. The event will kick off at the Towns County Swim Beach Pavilion at 9:00 a.m. with breakfast and coffee. Volunteer coordinators will lead teams of 5-10 to designated trash sites along the shoreline of Lake Chatuge, regrouping at the swim beach pavilion at 11:30 a.m. for prizes. The first 100 volunteers to sign-in will receive a free Rivers Alive t-shirt. Additional information on the Lake Chatuge clean-up effort can be found on the Hiwassee River Watershed Coalition website. YOUNG HARRIS, Ga. – Clean Sweep week proved to be a success, resulting in a cleaner environment for Towns County. The annual event took place from April 16 through 21, corresponding with Earth Day. Left to right: J.C. Berrong, Commissioner Cliff Bradshaw, and Pastor Steve Taylor of McConnell Baptist Church. 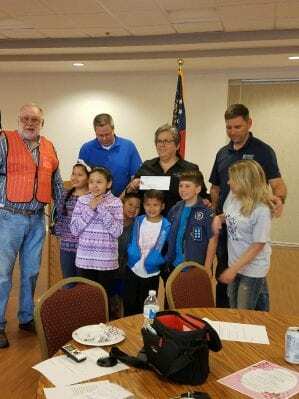 Volunteers donated their time by clearing the roadways of litter and attending a gratitude dinner hosted by Towns County Commissioner Cliff Bradshaw April 24, 2018, at the Towns County Recreation Center. Pizza and soft drinks were served, complements of the commission’s office. A total of 240 bags of litter were collected. 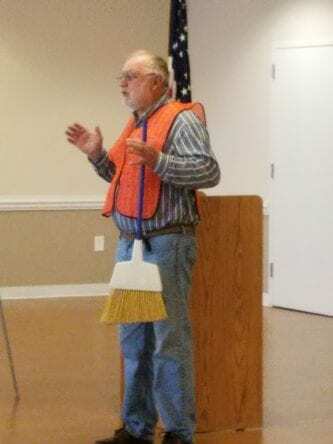 J.C. Berrong promoted and organized the Clean Sweep week. Commissioner Bradshaw honored Berrong with a certificate of appreciation for his dedicated service. 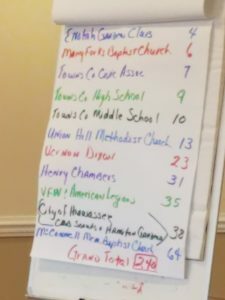 Cash prizes of $200 were awarded in three categories for the most trash collected by an individual, a church or business, and a club or organization. 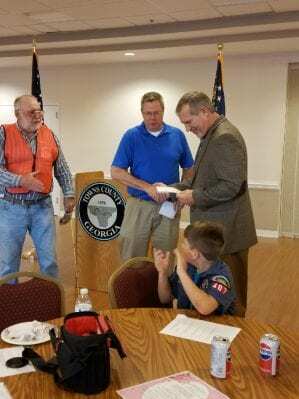 Henry Chambers, who yielded the largest amount in the individual category, along with the City of Hiawassee, who joined in effort with Hamilton Gardens, donated their prizes to the local Boy Scouts.